Hoi An is a small city located on Vietnam’s central coast. It’s about a forty-five minute drive south of Da Nang International Airport and definitely worth the short trip! Hoi An Ancient Town is a well preserved trading port that was used between the 15th and 19th centuries. For this reason, a combination of Chinese, Japanese and European influences can be seen throughout the town. A ticket to Ancient Town is required for the town’s attractions. For a few dollars, the ticket holder can choose five of the town’s twenty-two heritage attractions. There are museums, assembly halls, and ancient houses. I definitely recommend visiting Fukian Assembly Hall and the Japanese Covered Bridge. After visiting the attractions, spend some time exploring the cute shops and alley ways! Cua Dai and An Bang are the two closest beaches to Hoi An. They are both under a 20 minute drive from Hoi An Ancient town, with Cua Dai being slightly closer. An Bang has become the more popular of the two in recent years. Cua Dai, unfortunately, isn’t as beautiful as it once was due to erosion caused by recent storms and climate change. Expect to see sand bags piled up in areas along the shore. I still found it quite pretty and the crowds now flock to An Bang, so I felt like I had the beach to myself. Both beaches offer umbrellas and chairs for rent (bring cash), but An Bang has many more options when it comes to eateries. The Hoi An night market can be found on Nguyen Hoang Street in the center of town, on the opposite side of the river from Ancient Town. It’s open nightly and gets started around 7 pm, although vendors usually start selling as early as 5 pm. The street is illuminated by beautiful lanterns, making it a great place for photos. Local vendors line the street selling everything from clothing, jewelry, tasty street food, and even those lovely lanterns you see hanging everywhere! Don’t be afraid to bargain, most prices are inflated. A great way to see the town is by boat. I recommend hiring a sampan, a flat bottomed Chinese boat, to explore the Thu Bon River. This can be done as a day or evening activity. I would recommend going in the evening though. It will give you a chance to relax after a long day of sightseeing. You’ll also be able to enjoy all the beautiful lanterns that surround the river and light up the boats. Another option for larger groups is a sunset diner cruise on one of the bigger boats. Rosie Cafe is a great place for breakfast. It’s located in an alley way just a few minutes from the Japanese Covered Bridge. I recommend trying their veggie omelet. Located in the same alley as Rosie’s is Nu Cafe. I only had dessert here, but I heard the menu is fantastic. The mocha cake with peanut brittle and spiced cream cheese sounds unusual but is so delicious! I quickly became obsessed with a dumpling dish called White Rose. White Rose is an open faced dumpling made with rice paper and either shrimp or pork. They’re simple, but so good! I would recommend Hai Cafe or Morning Glory for these. The Bird House is a super cute cafe and the perfect place to sit and enjoy a coffee next to the river. They don’t serve food, but have a few pastries. 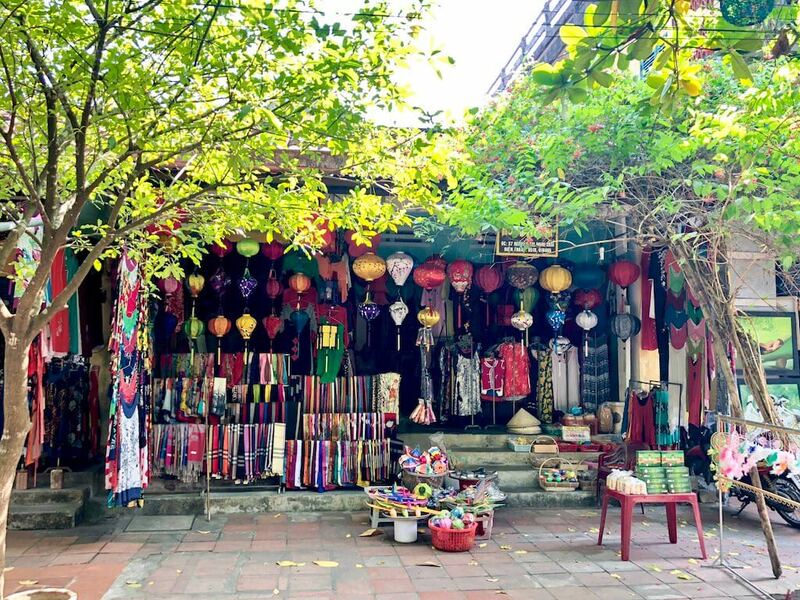 There is some amazing shopping to be done in Hoi An’s Ancient Town. You can find great housewares, bed linens, shoes, bags and clothing. Lots and lots of clothing! If you are interested in having some high quality clothing made at a great price, Hoi An is the place to do it. It is one of the best tailoring cities in the world. If you are planning on having something made, I would go as soon as you arrive in town, since the turn around time is usually a day or two. There are also plenty of ready-made options as well. I would recommend just walking around and exploring the streets. There are lots of high quality silk and leather items to be found, as well as some beautiful artwork in some of the galleries. A great way to spend a morning in Hoi An is at a cooking class. You’ll be able to learn some new recipes and be able to recreate them upon returning home. There are a lot of options as far as classes go in Hoi An. One great option is Ms. Vy’s Market Restaurant & Cooking School. Ms. Vy is the owner of some of Hoi An’s most successful restaurants, including Cargo, Vy’s Market, and the above mentioned Morning Glory. She no longer teaches the classes herself, but has a an excellent team in place that caters to all skill levels. Other options include Green Bamboo Cooking School and Hoi An Eco Cooking Class. If you are looking for a place to stay, I recommend checking out MGallery by Sofitel. Although, it was my hotel splurge of this trip, I got a great deal by U.S. standards. The hotel overlooks the river and has two beautiful pools, one of them being rooftop. The hotel is the perfect location for exploring Hoi An. It’s only about a ten minute walk from Ancient Town and it offers complimentary bikes! Looking for more things to do around Hoi An? Read my post about visiting Golden Bridge in Ba Na Hills here. look at those EATS! I can’t wait to visit Vietnam to just stuff my face with the ultimate cuisines for a couple weeks! This is a great list of things to do in Hoi An. I just loved those White Roses too. Visitors should also try Cau Lao, a local Hoi An noodle dish, so yummy.